Could you please tell me the exact numbers for that Sapphire card? Is it the Ultimate edition? I suspect there are many factors involved in the errors between one place and another. I have some suspicions. First off, the methodology is not the same everywhere. I'm not actually sure about the proper way to test a graphics card. For example, you can use a multimeter to measure the current and voltage at the 12V power input, that is relatively easy. However, this doesn't account for power usage through the PCI-e slot. Perhaps a good way would be to use a card with a known power consumption, and then use that to calibrate the system, then insert the new card. ? Also, almost every 8800GT card out there right now is running different memory and GPU speeds, which definately plays into power consumption. Something else to think about. I'm shifting between 8600GT and 8500GT. The specs of 43 and 40 watts must be for the GPU only on equal draw or something. Just looking at the passive cards from ASUS and Gigabyte the 8600GT looks more like 70W and 8500GT maybe like 40W. I dont know how much DDR3 draws compared to DDR2 but there must be a significant difference among others. On the other hand if they function well with undervolting 8600GT might be the way to go nevertheless. Here's a summary of power consumption data from matbe.com. i didnt think israelis liked france. hm. I'll try to update it when new reviews from xbitlabs are released. Last edited by kike_1974 on Wed Mar 05, 2008 6:25 am, edited 4 times in total. Any idea of 8400GS power consumption? I assume it's similar to 7300GS? Can anyone help me to get correct data for these cards so that I can add them to the table? Last edited by kike_1974 on Fri Jan 25, 2008 6:42 pm, edited 2 times in total. Last edited by kike_1974 on Fri Feb 08, 2008 10:22 am, edited 1 time in total. How would the HD 3450 256mb card fit into the scheme of things, as far as heat goes? I would specifically love to see the numbers for that card, and to know if it gets hotter than teh HD 2400XT when doing normal 2D stuff (photoshop). I just want a snappy little card that is the coolest card possible. I wouldnt imagine a video card would speed a system up as far as normal (non-gaming and non-rendering) computing goes. 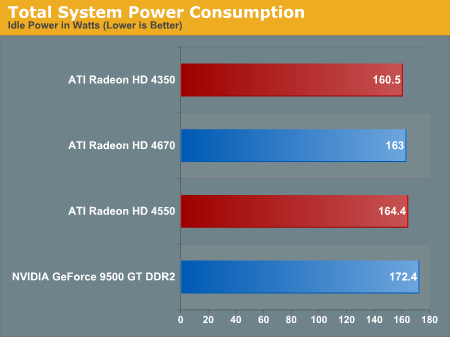 Idle power consumption of the HD 3650 and 3450 is almost the same than HD 3850. So, for the purposes of cool and quiet, modern 2D cards, the 2400XT should be quieter. Although, if you want HD encoding (i dont) then the 3450 looks pretty impressive and inexpensive. "For example, you can use a multimeter to measure the current and voltage at the 12V power input, that is relatively easy. However, this doesn't account for power usage through the PCI-e slot. " Its possible.. Tyan S5396 work station board has a seperate 12v power connector on it that only powers the top pci-e slot... figure this out cause I didn't have all the power connectors needed. Got Tyan to confirm too. Using this you could basicaly get perfect current draw on 12v rail. I think all PCIe cards draw almost nothing on the 5v rail... no idea on how to get this... but this isn't the biggest issue imo. The biggest issue left woudl be how do you get 'peak' 3d power draw? What game / benchmark / whatever? The biggest issue left woudl be how do you get 'peak' 3d power draw? What game / benchmark / whatever? I'd say a benchmark or stress tool, like rthdribl or the ATITool artifact checker. Games tend to be processor bound in various circumstances, and the load tends to be uneven even if processor power isn't the issue. Does the Radeon 2400 XT still have the lowest idel power consumption? I have a x1300 now and would love to save 10 watts at idle. Yes, the 2400XT is probably the lowest-consuming discrete card available. An Intel GMA onboard system will be lower still, but those are obviously difficult to add retrospectively. Cons: The heatsink on this card gets very hot. A customer of mine actually claimed to have smelled melting plastic from her computer earlier today, and I can think of no other culprit. For the money we will be putting into a PCI fan, it would have made more sense to have bought a fan cooled 2600 in the first place. Maybe it's not too late. iMac 2009, Logic Studio 9, Tannoy reveal 6D, Emu 0404USB 2.0, ..
btw, while at it, i'll put up the graph for the 9600gt, which was linked in some thread a couple of pages back. Lets hope that the 4850 idle power listed here is still being worked on and will go down with the 8.7 drivers as posted in the other thread. New low consumption card are 4350 and 4550. Under 20w at load. HD4550 have DDR3 memory, but just 64bit. Consumption is very similar, but power is not. HD4350 do in 3dmark 2006 2300-2600 points, HD4550 do 3700-4600 points. Gigabyte Z68XP-UD4+ [email protected]@1.000v, CM Hyper 212+, Gigabyte HD7750 2GB DDR3+Sapphire HD7750 OC 1GB DDR5, 2x4GB Corsair DDR3 [email protected]@1.3v, Samsung 1TB-F3, Thermaltake Armor Jr.,2x120 Revoltec,Zalman Fan mate2, FSP Aurum 400w GOLD, Idle 52 w, load cpu-OCCT-w, lynx-w, Load Gpu-3dmark vantage -max 100w with 1 gpu. Hi, Great topic, but still I am a bit overwhelmed with the new vga cards. I currently use the TNN 500 AF with a core2duo and a 7900 NVidia VGA card. I intent to update it to a quad-core 3Ghz, and now I am looking for a better VGA card, that does not exceef the 75W heat dissipation the chassis can handle. I'd prefer NVidia and 2x DVI-D outputs. Any suggestions? Tomshardware - How much power does your graphics card need? guess this is the right place to post some numbers I got the other week testing some of my old cards. This is just for reference, if you have an old system you want to make a fileserver of or something, and any gfx will do to make it work, AGP or PCI. Over the years I've gathered a few cards, and while I was clearing out all my other pc stuff I thought I'd better test these to see if they even worked. numbers are total W numbers for an old board, think it had a Celeron 500 and an oem 235W PSU. All could do 1024x768 ,24bit @75Hz minimum in XP, so are perfectly fine for remote controlling and surfing. These result made me change the deluxe combo I had just slapped unthinkigly in my 24/7 internet machine to the riva tnt, (have a use for the 2 lower cards) and finally undervolting the cpu as well, which saved me 30W in total. Plus they work on both AGP and PCI-E systems, handy if you don't have a 2nd PCI-E card around when you're switching your working system to a new one. Sony-NEC AD-7200S & Lite On LH-20A1H | Samsung HD501LJ & 4x F1 1TB. Only seen one review so far but the power consumption looks very good. Looks to me like the new 4850. 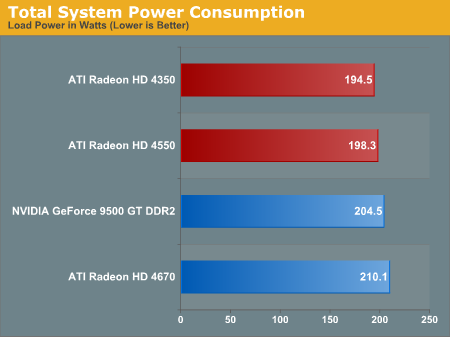 Power numbers barely lower, performance barely higher than 4850. My new hero is the 55nm GTX260. 216 shaders barely over 100 watts.